The Climb Iowa Team is made up of climbers of varying ages, motivations, and experience levels. 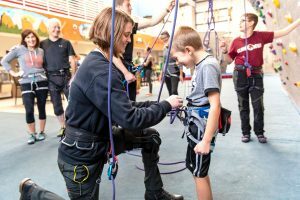 Youth from across Central Iowa come together for weekly practices in which they learn about climbing, engage their bodies and their minds in activity and experience community. Through climbing we seek to develop the lifelong skills of discipline, problem solving and teamwork in our athletes. Our coaches enjoy working with and sharing their passion for climbing with young climbers. Though our coaches seek to improve each athlete’s climbing ability, they also encourage each climber to grow into a well-rounded, healthy individual. By learning about each climbers’ motivations and passions, coaches are better able to encourage athletes to pursue their individual interests in regards to climbing. Being a part of the climbing team connects young climbers with a local as well as a global community of positive and healthy individuals. Check it out! Pick out which recreational team is right for your climber’s age. If you are interested in our competition team, please read the section on team options. Decide which method of payment is most appropriate for you. Contact our head recreational coach with your desired practice frequency and coaching session time. 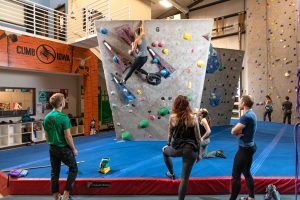 Recreational Team – This team is a good fit for climbers new to the sport of climbing and/or climbers interested in pursuing a fun physical and mental activity at their own pace. Climbers may sign up for the Climb Iowa Recreational Team at any point from August – May. Climbing Team runs from September – May. There are team options for climbers age 5 – 18. Competition Team – This team is for climbers interested in participating and training for the sport of climbing. Placement on this team is based on tryouts before each season starts. Advancement to this team after a season has started is only possible from the Recreational Team. A recommendation from our coaching staff is required. There are team options for climbers age 8 – 18. *Availability varies depending on class sizes. This option includes the team dues for 9 months of climbing team and membership fees for 12 months. Fee is based on the number of practices per week and the number of climbers per family. This option must be combined with a prepaid or EFT membership. Fee is based on the number of practices per week and the number of climbers per family. How do I sign up for the recreational team? 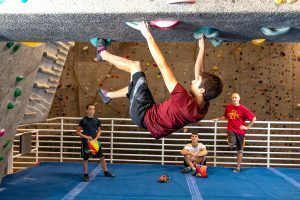 Climbers interested in participating in the Recreational Team may contact the Head Team Coach, or you may speak to a staff member at the front desk regarding class availability. Climbers may sign up at any point throughout the climbing season (September – May). Availability fluctuates throughout the year and some sessions will become full. How do I select a practice time for team? See “How do I get started?” above. How often does a team practice? Recreational Team climbers can choose between one, two, or three nights of practice per week. Competition Team members are required to practice a certain number of days per week depending on which team the climber is on. Contact the Head Competition Team Coach for more information. What if I already have a prepaid membership when I sign-up for the team? Contact the Grimes Gym Manager to provide the best option to suit your needs.